With the football season in the south beginning to reach its climax there were six South of Scotland League matches played last Saturday. Title favourites St Cuthbert Wanderers travelled to Sanquhar to play Nithsdale Wanderers for a match the visitors had to win to take them to the top of the league table. Nithsdale proved to be a stuffy team though and took the lead after only 30 seconds through Sean Mullen but Saints struck back with 24 minutes played with striker Andrew Donley finding the net to level the match. A minute from the break Saints took the lead when Donley was fouled in the box and stepped up to score from the penalty spot. 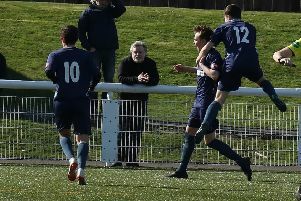 Stephen Degnam added a third to secure the three points for the league title favourites and with games in hand to nearest challengers Edosport Academy the Kirkudbright side look near certainties to lift the championship. Creetown played hosts to neighbours Fleet Star for a match that looked like it go either way but a Ben Herries hat-trick ensured victory for the home side while Crichton entertained Upper Annandale at Hospital Park and took the three points in a 2-0 victory. Dumfries YMCA are still looking to get off bottom spot in the table and were again beaten when they fell by 7-0 to Heston Rovers although the visitors had only a Jonathon Boyd goal to show for their endeavours at the break. Boyd scored a second after the re-start and goals from Alex Maxwell, Kenni Dinnell, Robson Halliday and Sean Kevan added to an own goal saw Heston run out comfortable winners. Newton Stewart and Lochar Thistle locked horns at Blairmount Park for a match that produced a series of missed chances for both sides and in particular the Creesiders. However Lochar found the net once through Craig McCrone early into the second half to take the points and the spoils from this very exciting contest. Present champions Wigtown and Bladnoch played hosts to Abbey Vale at Trammondford Park when a goal in each half from Blair Dougan was enough to see off the challenge from the visitors. There was also a third round Challenge Cup tie match played at Lockerbie where Mid-Annandale and Edusport Academy met each other to see who progressed further in this particular competition with the visitors doing so by virtue of a 4-0 victory. Pierre Siffredi put Edu ahead five minutes before the break and although Mids did well to hold out eventually fitness told and the visitors went to score three goas in the final 20 minutes with Bandi Touri scoring a brace and Juan Lucan scoring a single.